Comes with screen size of up to 82” with the display area of 64.5" x 45.1"
Comes with the exclusive OneScreen Swap and OneScreen Annotate software that make the IWB1 a highly competent solution for interactive purposes. Product dimensions are 69.1" x 49.4"
OneScreen has always introduced a number of impressive products when it comes to the collaborative solutions. With low price and high quality OneScreen has achieved adequate market share with 100% customer satisfaction. In order to facilitate education sector with ultra-modern facilities, OneScreen offers the amazing IWB1 interactive whiteboard. Engineered with sturdy Aluminum Alloy frame, the OneScreen IWB1 has proven to be an extremely reliable interactive whiteboard. The surface material is designed to reduce glares and shadows by ensuring sleek and shiny appearance. With up to 82” display area and high resolution, the OneScreen interactive whiteboard captures attention of the audience by delivering vibrant colors and rich graphics in a large-sized room. Modern education requires up-to-the-mark solutions, therefore OneScreen interactive whiteboard has infrared touch technology with up to 10 touch points. Now, students will get the best interactive solution for their learning requirements. With these features, students will be able to collaborate, participate in interactive class activities and share their data with each other conveniently. With the unprecedented handwriting recognition feature, students and teachers can write on the whiteboard and it will automatically convert the hand-written text in to a computer generated font. Now, forget those days where you used to write on a board and it was hard for the audience to understand, the OneScreen interactive whiteboard does it all for you. The OneScreen interactive whiteboard comes with an exclusive OneScreen Annotate Software that allows easy data sharing, smooth drag-n-drop options. It is now possible for the teachers to record the lesson and save it in several popular formats. Now, students will be more focused towards learning rather than making additional notes for the lectures, thanks to the OneScreen innovative solutions. The OneScreen Swap software is another remarkable innovation by OneScreen that does not only allow users to share the screen instantly but also make it possible to control the screen securely. This feature is extremely useful for distance learning, as students will be able to interact in real-time with teachers by getting the proximate learning environment. 73.0" x 53.0" x 4.5"
Q. The OneScreen IWB1 interactive whiteboard is connected to the computer and drivers are installed, still the touch does not work? Q. 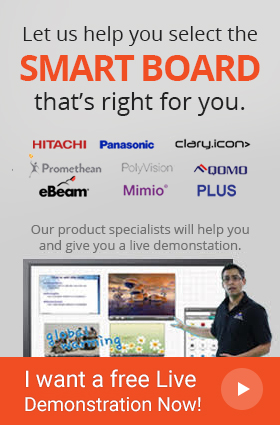 Where can I get the brochure for OneScreen IWB1 interactive whiteboard? Q. Can I connect a USB drive with the OneScreen IWB1 interactive whiteboard? A. Yes, you can connect the USB drive, there is a dedicated slot available in OneScreen IWB1 interactive whiteboard. Q. Does the OneScreen IWB1 interactive whiteboard come with a warranty? A. The OneScreen IWB1 interactive whiteboard comes with 1 year warranty and OneScreen’s Screen Skills Guru Service that provide live, free and unlimited support and training.